Tranquil blue and white flowers reminiscent of a soft ocean breeze offer comfort. 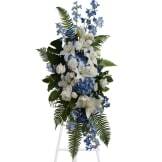 The standing spray presented on an easel includes fragrant white lilies and tropical greenery. This standing spray includes blue hydrangea and delphinium, white roses and asiatic lilies, plus tropical ferns and leaves. 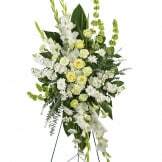 Flowers will be received by a Deerfoot Memorial Funeral Home's staff. Thank you....the flowers were so beautiful and I absolutely am happy how it turned out. Awesome job. Service was great and customer service was great. The flowers were beautiful! Exactly as the picture promised and delivered early! I couldn't have asked for and easier way to get flowers for my uncles funeral. I wasn't able to attend and didn't see it. My daughter in law said it was so meaningful and thank me from her mom, grandmother and herself. All the flowers in it had a meaning for all. This arrangement was exactly as pictured and it was very appreciated by the family. When this was delivered for the viewing day it was beautiful however, all of the blue flowers in the middle completely wilted by the next day's funeral. It is summer here but having them wilted at the funeral was a little embarrassing. Maybe those flowers are too delicate since the white flowers were ok. I expected my order to be delivered the day of the funeral and to my surprise it was actually delivered during the visitation..... Which was great! 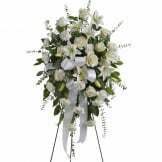 I was pleased with how beautiful the arrangement was and that I ordered it at 5pm on a Saturday and it was at the funeral home when I arrived Sunday at 1pm. I did not get the confirmation via email until Tuesday for some reason. Ordering was a pleasant experience that took stress off of me since is was super convenient to order. It's hard to know what to send and flowers don't even seem to be enough. But this really was gorgeous and looked just like the photo. It brought some beauty to a tough time. I have sent this arrangemet two times for different funerals. Both times the families commented on how beautiful the arrangement was. I would send this again. 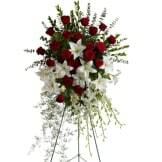 All of our flowers are designed and delivered by hand from a local florist in in Trussville.